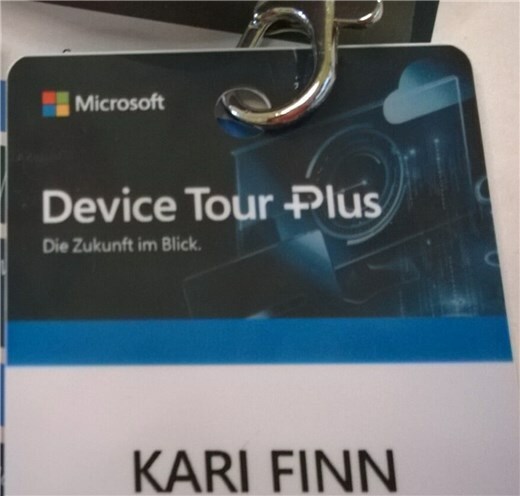 I was invited to the Microsoft Device Tour Plus when it arrived at my adopted home town of Leipzig (Germany) last week. As I am always interested in free breakfast, lunch and dinner, so I decided to go there despite my current health issues. I was not expecting much, if any, new information. That said, I was positively and pleasantly surprised to actually hear and learn something new and interesting at the event. This time, the Device Tour was fully built around a “Modern and Secure Workplace” concept. For me, the most important and interesting session was about Windows 7 End of Life / End of Support and how to prepare for that. (This is a topic we have covered earlier here on Win10.guru). From my point of view, what was really interesting was what Manfred Helber, a Microsoft partner and MVP said about Windows 7 and 10 upgrade and licensing. Microsoft has never even remotely commented on why the free upgrade still works. I am relatively sure that it will work until end of life of Windows 7, January 14th 2020, and in Windows 8.1 case until January 2023. Whatever reason lies behind this extremely extended free offer, I cannot recommend using it in organizations. Feel free to upgrade your personal devices to Windows 10 for free, though. Manfred Helber confirmed what I had posted, you can still activate WIndows 10 with Windows 7 / 8 product keys and you can still upgrade for free. However, those users who have upgraded for free since the official offer ended on July 29th, 2016, or who have used Windows 7 / 8 product keys after that date to activate Windows 10, might face issues in the future. According to Helber, Microsoft is well aware that people are still using this “unofficial” free upgrade, but as Microsoft activation servers have all required information, it is possible that in the future Microsoft will remove digital licenses from those devices upgraded after July 29th, 2016 (the official end date for that free upgrade offer), or Windows 10 devices which have been activated with a Windows 7 / 8 product key after that date. I have no other factual knowledge about this matter, I am only repeating what Manfred Helber said in the session he hosted at an official Microsoft event. In any case, it is something to consider in any organization thinking to choose this “not-so-kosher” approach. Before anything else, let me tell you that everything I say about Bluechip here is my personal, unbiased opinion. It is not sponsored content, nor was I asked to write anything about the company or its products. Another interesting, new thing for me was to learn about Bluechip (@bluechip_ag), a German solution provider and computer manufacturer. I must admit I had never heard about Bluechip, but after their product manager Matthias Geburzi told me about their products, I was sold. In fact, two of their devices, an i7 based 17″ gaming laptop and Celeron N3350 based 12″ tablet might well be the next two devices I will buy! Stunning look and feel, good specifications. One problem I immediately noticed is that the Bluechip website is only available in German, and their devices come at the moment only with a German keyboard layout. Windows 10 being in German, too, is naturally not an issue, every geek knows how to change Windows system language, but I would really like to see Bluechip expanding outside its current German-speaking market region. These devices are so good I would like to see them available all over the world. According to what I learned, Bluechip is quite good in offering “Workplace-as-a-Service” across all of German-speaking Europe. Their concept is good, and as with their devices, I for sure wish they’d expand this to more languages and regions. All in all, I had a nice day at Microsoft Device Tour Plus. I got what I expected, free breakfast, lunch and dinner, but in addition I also had an opportunity to learn something new. That’s a real bonus!